Zebra and quagga mussels have not invaded Pacific Northwest waters yet, but it's probably only a matter of time, according to some water managers in the region. "It's when, not if," said Larry Pennington, water quality coordinator for the North Side Canal Co. in south-central Idaho. DNA from a suspect dreissenid species was found along the north shore of Flathead Lake in Western Montana in November, but officials haven't confirmed it as an invasive mussel species. Pennington is not optimistic that quagga and zebra mussels, the two invasive species of most concern, would find Northwest waters disagreeable. The mineral content and temperature of Northwest waters is well within their "likable" range, he said. "If we can just keep them out for a year or two or three it will give us that much more time to figure out a way to kill these rascals or control them or something," Pennington said. The tiny snail-like creatures were first detected in the Colorado River system in 2007. They've clogged boat motors at Lake Mead and Lake Havasu, plugged intake pipes at major dams and created headaches for irrigation managers. In the Northwest, the invaders could clog sprinkler irrigation systems and the small hydroelectric plants that some irrigation districts have installed on their canals systems, Pennington said. "Once we get them we are going to have to completely change the paradigm of how we do things," he said. An interagency plan known as the 100th Meridian Initiative was formulated in 2008 in an effort to keep the pests out of the Columbia River Basin. Participants include the states of Idaho, Montana, Oregon and Washington, the U.S. Fish and Wildlife Service, National Oceanic and Atmospheric Administration and the Columbia River Intertribal Fish Commission. The initiative requires participants to implement a response plan in the event that invasive mussel species are detected in Columbia River Basin waters. 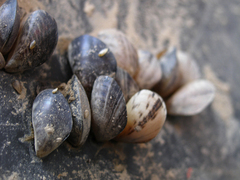 A report submitted to a regional aquatic nuisance species task force in February 2010 warned that without "increased and immediate action, quagga and zebra mussels will cause irreparable ecological damage to western waters and long-term costs will be in the billions." In Idaho, the conservative estimate of statewide direct and indirect costs from the establishment of dreissenid mussels is about $94 million. The Northside Canal Co. has been monitoring a stretch of the Snake River from King Hill to Milner Dam since 2004. So far they haven't found anything, and water manager hope it stays that way. "I love the number zero," Pennington said.